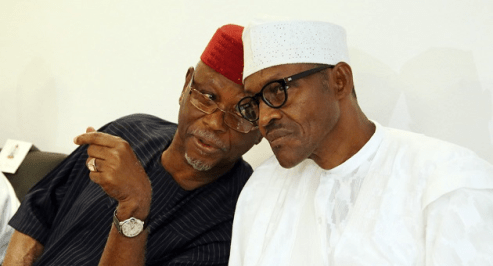 LAGOS JULY 9TH (URHOBOTODAY)-National Chairman of the All Progressives Congress (APC), Chief John Odigie-Oyegun, has admitted that President Muhammadu Buhari is no longer popular like he was during the 2015 general election. “All governments worldwide in between terms lose some degree of popularity; no question about that,” he told Punch. “We are having harsh economic times, no question about that and that does not increase the popularity of any government. It only diminishes it to some extent. What is different is that, in our case, in spite of the harsh economic realities, the people still have full confidence, trust. “I think that is the proper word, in President Buhari, that he will do his very best to improve their lot and I think the proof of that was the reaction to the threatened strikes by the labour unions. You can see that even though people are unhappy, they refused to come out because they understood. “They are in pain but they understood why the pain was there and they trusted the President that he was doing everything within his power to ameliorate their pain. So yes, there is a lot of grumbling all over the place, but also there is a lot of trust in Mr. President”, he added. On internal crisis in some states, including Kano, Bayelsa and Kogi, Oyegun said APC was attending to each of them. “In vevery case, we are making progress. Bayelsa should be concluded in a matter of weeks. Kano is basically a personality thing and we’ve got everybody to sheathe their swords for now. “And I think that has happened. Kano has cooled off. We also have issues in Kogi State which we are also attending to. That is the only way you know a government that is in power. “If we were in opposition, there won’t be skirmishes in these states because there would be nothing to skirmish over but since we are in power, people are still struggling for relative importance within the system with an eye on tomorrow. “These things are normal, they are expected but we’ve developed that habit of democratic consultation and reconciliation and it is working”, he added.